New Trojan T-1275 Golf cart Battery Free Delivery to most locations in the lower 48 States*. > TROJAN BATTERY PRICING FOR NORTHEASTERN STATES> TROJAN Golf Cart, Gem Car, Ford Think & Utility Vehicle Batteries. 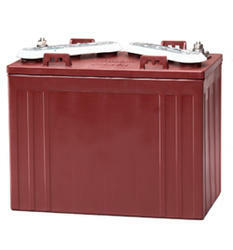 New Trojan T-1275 12 Volt Deep Cycle Golf Cart Battery Free Delivery to many locations in the Northeast. New Trojan T-1275 Golf Cart Battery Free Delivery to many locations in the Northeast. New York, New Hampshire, New Jerseys, Rhode Island, Maine, Massachusetts, Delaware, Connecticut, Vermont, Pennsylvania, Ohio, West Virginia and Virginia. For use in Club Cars, Gem Cars. Call 888-737-5681 or Email us usabatterysales.com@gmail.com with your location before ordering to see if you qualify for our free delivery offer. The Trojan T-1275 batteries are sold with core exchanged at the time of the delivery. The core cost is $36.00 per battery if you do not have a core.